Alice in Wonderland: The Mad Hatter's Tea Party brings this classic and beloved story to a new generation of young children. 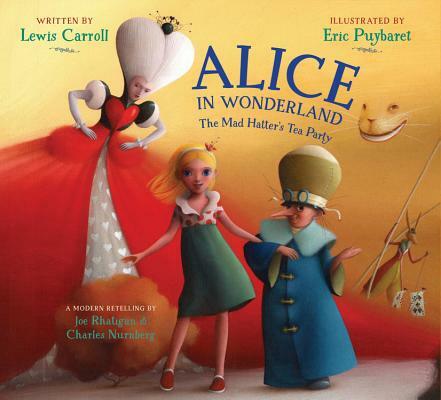 Alice in Wonderland: The Mad Hatter's Tea Party provides a faithful introduction to the classic and to Carroll's incredible imagination, something so magical that children will recall it when they are older and ready for the original work. With the simply extraordinary art of Eric Puybaret, Alice and her friends come brilliantly to life for the picture book reader. Read along as Alice encounters the Cheshire Cat, attends a tea party with the Mad Hatter and his friends, plays croquet with the Queen and her retinue, defends herself at trial, and ultimately returns home. Though the original Alice text might be too difficult to understand for pre-readers, the one-of-a-kind characters and fantastical situations are silly and fun and perfect for a picture book adaptation. Charles Lutwidge Dodgson (1832-1898), known by his pen name, Lewis Carroll, was an English mathematician, photographer, and prolific writer, especially known for his beloved books Alice's Adventures in Wonderland and Through the Looking-Glass. Preferring the company of children to adults, his Alice books were inspired by his friendship with the young Alice Liddell, the daughter of the Dean of Christ Church, where Carroll was a mathematics instructor. Eric Puybaret is the best-selling illustrator of Puff the Magic Dragon, The Night Before Christmas, Over the Rainbow, Alice in Wonderland: Down the Rabbit Hole, and When You Wish Upon a Star, as well as numerous books in his native France. Puybaret's art has been called "elegantly rendered," by the New York Times, "graceful [and] whimsical," by Publishers Weekly; and "lovely ... and indeed magical," by Kirkus Reviews.